Reginald Foort's account of his recording experiences (written in 1932), taken from Chapter10 of his book "The Cinema Organ", pages 96-109. "SILENCE PLEASE! ORGAN RECORDING. . . "
Soon after I began to play the cinema organ, I heard the first examples of gramophone records made by Jesse Crawford, and I shall never forget my disappointment; I had said to myself "Now I am going to hear records made by this famous American organist," and I really hoped to learn something about playing a cinema organ. I realized afterwards that these records had been made by the old-fashioned method before electrical recording had been invented.Electrical recording has, of course, completely revolutionized the problem of making organ records. The organ is, by its very nature, a terribly difficult instrument to record. The compass between the lowest notes on the pedals and the highest pipes of 2 ft. pitch is enormous and many modifications and improvements have been made by the recording experts specially for the purpose of organ recording. My first experience in this connection was at the New Gallery in 1926. In those days, the Gramophone Co. used the small Queen's Hall, near Oxford Circus, as their recording studio, so they made use of ordinary Post Office telephone lines, stuck a microphone in front of the New Gallery organ, and the sounds were actually recorded in the small Queen's Hall, through the GERrard exchange. In view of all the trouble we had with noises on the lines and the number of times we got cut off in the middle of a record (I don't remember that we actually experienced getting a wrong number or being told that there was "no reply'), it is really rather wonderful that we were able to get as good results as we did. My record of In a Monastery Garden, which has had, I believe, one of the largest sales of any record ever made, was actually recorded in this way. Soon after this, the same company had the splendid idea of fitting up a mobile recording equipment. This consisted of a large, ultra-luxurious motor van containing two complete recording machines, and cost about £8,000. Although this is still used to a considerable extent, all the companies find that they get still better results by bringing all the recording gear actually into the theatre itself, so now, when a recording session is about to take place, several lorries arrive, bringing many hundredweights of gear and deposit it in the theatre the day before. Organ recording is inclined to be unpopular with the staff of the theatre; it means that they have to get up a couple of hours earlier in order to have all cleaning done before we start (usually about 9.30 a.m.), and for the remainder of the morning they all have to creep about like mice. However, in spite of all precautions, some one invariably forgets that recording is going on and drops a bucket or bursts into song in the middle of one's best effort. Why it should be so I cannot tell, but I personally find organ recording a most nervy job. I have played the organ at the Albert Hail to 10,000 people without turning a hair, and I positively enjoy broadcasting, when I have an audience of, I suppose, several millions, and yet, when the warning buzzer goes and the little red signal lamp lights up, my fingers begin to tremble and I feel shaky at the knees and become firmly convinced that I am going to play dozens of wrong notes, which will all be chalked up against me permanently and for ever! There is no reason, of course, that this should be so. If you are recording and play a wrong note or push a wrong piston, you just stop, the recorder puts on a fresh wax, and you start all over again; fortunately , you are too far away from him to hear what he thinks of you for giving him so much trouble! I shall never forget one particular session in which, by 10.30 a.m., I had finished records of the two numbers from the Desert Song. Then I started to try to record the first side of Katzmann's arrangement of the Casse-Noisette Suite, and, in order to get the length right, I had to make big alterations and transpose whole lines of music. For some unaccountable reason I lost confidence in myself and began to get nervous; after spoiling eleven waxes in succession, in each of which I had gone wrong in a different place, we gave it up and went out to lunch. I am glad to say that I started my next session with the same number and recorded it right off without any difficulty. The reader will probably be interested to have some idea of the actual procedure of making an organ record. I suppose the story really starts with the arguments one has with the recording company, probably over the 'phone, as to the choice of items; you spend sleepless nights thinking out pieces which you know will make superb organ records if only you can persuade the powers that be to let you record them, and they convince you, entirely against your will, that the pieces that they want recorded are more suitable. The next thing, after the titles have been finally decided, is to wander down to the theatre as many days as possible in advance of the session, some time about the hour when the yodel of the early milkman is heard, in a probably vain attempt to get a little peace and quiet in the theatre before the cleaners arrive, to try to think out some hitherto undiscovered idea for making an original arrangement of the pieces to be recorded. I believe one of the secrets of my own success in making gramophone records is that I have trained myself to be able, having once decided exactly how I want to play a composition, to play it over and over again as many times as are necessary in precisely the same way, without making any alterations of stops or interpretation. The morning of the session arrives and you go down to the theatre an hour before the time for the session to begin, to give yourself plenty of time to get everything set. "SILENCE PLEASE! ORGAN RECORDING" cards have to be placed in conspicuous positions outside all doors leading to the auditorium. Some of the combinations of stops set on the pistons must be altered, the tuner is having a final run over the organ to see that everything is in perfect order. the recording staff will be running lines for the microphone and having a final glance to make sure all their gear is correct. The microphone is suspended on a wire in front of the grill through which the sound reaches the theatre, and a buzzer and a red signal light are placed close to the console. The records are actually made on soft wax "blanks", which look something like ordinary records, but are each an inch thick. The recording gear is placed in a small room somewhere out of hearing of the organ itself, the sounds reaching the recording machines through long electric wires, via the microphone. The wax "blanks" have to be kept at an exact, rather high temperature, so they are stored in an electrically heated cupboard. As soon as a "blank" has been placed on the recording machine, we are all ready to commence operations. We sit down at the console and play over the first number to be recorded, to give the recorder some idea as to the volume of tone it is proposed to use; then, having ensured that the length is correct (and it is extraordinary how difficult it is to arrange a piece to fit exactly a 10-in. or a 12-in. record), we are ready to make the first test. The recorder sounds the buzzer twice as a kind of first warning. I shout : "Silence please!" in stentorian tones, hoping thereby to soften the heart of any stray cleaner so that she will refrain from coughing or rattling her bucket. A few seconds afterwards, the recorder gives a single short buzz as a final warning, and then, after a moment which seems like an unconscionable time of nervous waiting, during which your hands begin to feel like nothing on earth, the recorder lowers the cutting needle on to the soft wax and switches on the red light. This is the signal to start playing. At the end of the three or four minutes, as the case may be, I cease playing and sit in absolute silence until I get a final buzz to let me know that the needle is off the wax. 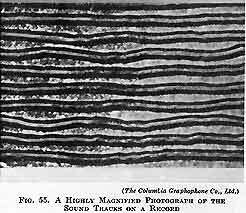 Then the whole process is reversed, and, after the sound tracks have been examined by the recorder through a microscope, the test record is played back just like an ordinary record, through an electric gramophone. Incidentally, I think the biggest thrill I ever had in my life, with the possible exception of seeing Jellicoe's flagship the Iron Duke open fire at Jutland, was hearing myself play the organ when the first test record I ever made was played back to me. This "play-back" from the soft wax is not completely satisfactory as it does not sound exactly the same as if it were a finished record, but it gives one a fair idea of what the record will ultimately sound like. If the recorders are satisfied with the appearance of the sound-tracks and I like the sound of the play-back, we shall probably go ahead and try to make a "master" record; on the other hand, I may not like the effect of some parts of the record as played back to me; or the recorder may ask me to make some modifications in the registration or the volume, in which case it will be necessary to make another test. Making a "master" record is precisely the same as making a test, except that the record cannot afterwards be played back again, as this would destroy the sound-tracks so that it could not be used as a "master." I usually make three or four "masters" of each title and then choose two of these to be sent through to the factory to be made up. 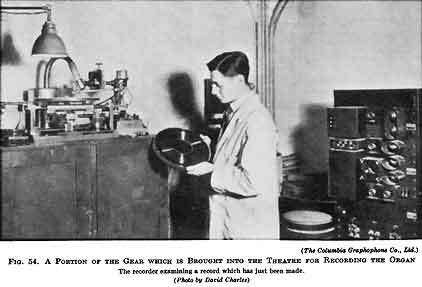 I am indebted to the Columbia Graphophone Company, Limited - for whom I record exclusively - for the following description of the process of manufacturing records, and for their courtesy in allowing me to reproduce the photographs taken while I was actually making records on the Regal organ. 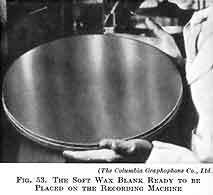 After my playing in the theatre has been recorded on the soft wax "blank," this "master record," as it is now called, is transported to the factory, specially treated in a dust-proof laboratory, and then placed in an electrolytic bath, in which it is plated with copper, making a copper negative of the record, called a "matrix." The matrix is mounted on a solid foundation and from it are pressed the records which you buy in the shop, the process being carried out in a huge hydraulic press; a pressure of sixty tons is required to make each record, and the labels are pressed on in the same operation. 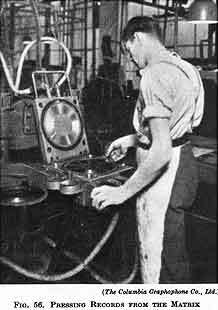 The newly pressed record has a rough edge which is smoothed by machinery. Finally, every record is cleaned and polished and carefully inspected to ensure that it is up to standard and perfect in every respect. One of the most curious sessions I can remember was when we recorded the organ in the New Victoria Theatre, London. Two days before the theatre was opened, there was a special Press show to give representatives of the Press an opportunity of inspecting the theatre. As we had arranged to have the recording session immediately following this, we thought it would be a good idea to give the journalists a demonstration of organ recording. I therefore took the console up on the lift and explained what we proposed to do, but I am afraid they were more interested in inspecting the decorations, to say nothing of the refreshments which were being dispensed at the back of the circle. However, the recording staff placed a microphone on the front of the circle, I played my selection and it was duly recorded. Then the record was immediately played back off the soft wax by means of the two 1,000 volt amplifiers which the John Compton Organ Co. had installed for the purpose of amplifying the organ into the stalls beneath the circle. Unfortunately, I had taken the organ lift down and the journalists, who were all up in the circle, were unable to see that I was no longer playing the organ. It may sound incredible, but most of them mistook the play-back through the amplifiers for the actual playing of the organ, thought that our first effort had been a failure, and that I was making the record over again, and gave it up as a bad job and went home to bed at least, that is what the representative of the Cinema said in his paper the next morning. He was most surprised when I called a few days later and told him that what he heard was actually the record that I had made! Later that evening, after the representatives of the Press had departed, we started our session about midnight, but we were constantly interrupted by members of the theatre staff proudly escorting their friends through the theatre on tours of inspection; after several hours of hard work and many wasted waxes, however, we did finally succeed in. getting master records of both sides of my Musical Trip Round the British Isles. Our last wax but one was ruined by an over-zealous electrician walking about on the roof of the organ chambers while I was playing; although we did not notice it at the time, the " thump-thump " of his feet could be heard quite distinctly in the record we got back from the factory! I am afraid the question of organ recording in this country has never been taken as seriously as it has in America. All the organ records which have been made in England have had to be recorded in the actual theatres, where neither the organs nor the acoustics of the theatres are at all suitable. Jesse Crawford has everything in his favour, as he does his recording on a large three-manual organ, designed and built for the purpose, in a specially-constructed studio. Considering all the difficulties with which we have had to contend, it is really rather amazing that we English organists have succeeded in turning out as good organ records as we have. 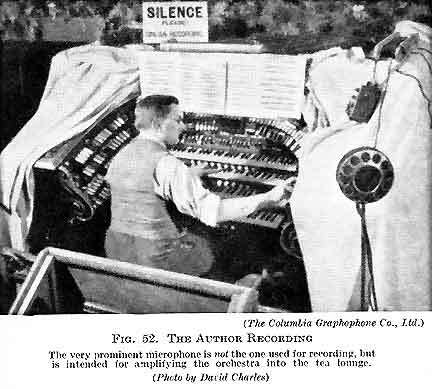 The problems of recording a small two-manual, eight-rank organ, like the one in the New Gallery, were considerable, but I think the success which the Columbia Company have made in recording the Regal organ is really gratifying, in view of the incredible difficulties presented by the enormous range of volume, pitch, and variety of tone, which are characteristic of this huge four-manual instrument, to say nothing of the by no means helpful acoustics of the theatre. The record of Choo-Choo which I made on this organ must be almost a miracle of technical recording. When I was asked to record this number, I all but refused to do so, feeling convinced that the recorders would be quite unable to get any kind of a reproduction of the way I wanted to play it. I took them to the organ and showed them how I got the train effect by putting down about two dozen of the heavy stops on the Great and simply laying both hands flat on the keys, but they cheerfully replied: "Don't bother about that, go ahead and play it how you like, and we will undertake to record it for you." And this they certainly did, though how on earth they ever managed to persuade the recording needle not to jump off the wax altogether , I cannot imagine. I really believe this must be the most remarkable example of recording which has ever been achieved. Several of Reginald Foort's recordings, including some of those mentioned in the text above (which have hyperlinks), can be heard on The Virtual Radiogram.